For the album by Ben Folds Five, see The Unauthorized Biography of Reinhold Messner. Reinhold Messner (German pronunciation: [ˈʁaɪ̯nhɔlt ˈmɛsnɐ]; born 17 September 1944) is an Italian mountaineer, adventurer, explorer, and author from the trilingual Italian province of South Tyrol. He made the first solo ascent of Mount Everest, the first ascent of Everest without supplemental oxygen, along with Peter Habeler, and was the first climber to ascend all fourteen peaks over 8,000 metres (26,000 ft) above sea level. He was also the first person to cross Antarctica and Greenland with neither snowmobiles nor dog sleds. Furthermore, he crossed the Gobi Desert alone. Messner also published more than 80 books about his experiences as a climber and explorer. In 2018 he received jointly with Krzysztof Wielicki the Princess of Asturias Award in the category of Sports. Born in Brixen (Bressanone) in the Italian province South Tyrol, Messner grew up in Villnöß and spent his early years climbing in the Alps and falling in love with the Dolomites. His father, Josef Messner, was a teacher. He was also very strict and sometimes severe with Reinhold. Josef led Reinhold to his first summit at the age of five. Reinhold had eight brothers and one sister; he later climbed with his brother Günther and made Arctic crossings with his brother Hubert. When Reinhold was 13, he began climbing with his brother Günther, age 11. By the time Reinhold and Günther were in their early twenties, they were among Europe's best climbers. Since the 1960s, Messner, inspired by Hermann Buhl, was one of the first and most enthusiastic supporters of alpine style mountaineering in the Himalayas, which consisted of climbing with very light equipment and a minimum of external help. Messner considered the usual expedition style ("siege tactics") disrespectful toward nature and mountains. Messner's first major Himalayan climb in 1970, the unclimbed Rupal face of Nanga Parbat, turned out to be a tragic success. Both he and his brother Günther reached the summit, but Günther died two days later on the descent of the Diamir face. Reinhold lost six toes, which had become badly frostbitten during the climb and required amputation. Reinhold was severely criticized for persisting on this climb with the less experienced Günther. The 2010 movie Nanga Parbat by Joseph Vilsmaier is based on his account of the events. While Messner and Peter Habeler were noted for fast ascents in the Alps of the Eiger North Wall, standard route (10 hours) and Les Droites (8 hours), his 1975 Gasherbrum I first ascent of a new route took three days. This was unheard of at the time. In the 1970s, Messner championed the cause for ascending Mount Everest without supplementary oxygen, saying that he would do it "by fair means" or not at all. In 1978, he reached the summit of Everest with Habeler. This was the first time anyone had been that high without bottled oxygen and Messner and Habeler achieved what certain doctors, specialists, and mountaineers thought impossible. He repeated the feat, without Habeler, from the Tibetan side in 1980, during the monsoon season. This was Everest's first solo summit. In 1978, he made a solo ascent of the Diamir face of Nanga Parbat. In 1986, Messner became the first to complete all fourteen eight-thousanders (peaks over 8,000 metres above sea level). Messner has crossed Antarctica on skis, together with fellow explorer Arved Fuchs. He has written over 60 books about his experiences, a quarter of which have been translated. He was featured in the 1984 film The Dark Glow of the Mountains by Werner Herzog. Messner today carries on a diversified business related to his mountaineering skills. From 1999 to 2004, he held political office as a Member of the European Parliament for the Italian Green Party (Federazione dei Verdi). He was also among the founders of Mountain Wilderness, an international NGO dedicated to the protection of mountains worldwide. In 2004 he completed a 2,000-kilometre (1,200 mi) expedition through the Gobi desert. He now mainly devotes himself to the Messner Mountain Museum, of which he is the founder. Up to 1970, Reinhold Messner had made a name for himself mainly through his achievements in the Alps. Between 1960 and 1964, he led over 500 ascents, most of them in the Dolomites. In 1965, he climbed a new direttissima route on the north face of the Ortler. A year later, he climbed the Walker Spur on the Grandes Jorasses and ascended the Rocchetta Alta di Bosconero. In 1967 he made the first ascent of the northeast face of the Agnér and the first winter ascents of the Agnér north face and Furchetta north face. In 1968 he achieved further firsts: the Heiligkreuzkofel middle pillar and the direct south face of the Marmolada. In the following year, Messner joined an Andes expedition, during which he succeeded, together with Peter Habeler, in making the first ascent of the Yerupaja east face up to the summit ridge and, a few days later, the first ascent of the 6,121-metre-high Yerupaja Chico He also made the first solo ascent of the Droites north face, the Philipp-Flamm intersection on the Civetta and the south face of Marmolata di Rocca. As a result of his achievements, Messner won the reputation of being one of the best climbers in Europe. So, in 1970, he was invited to join a major Himalayan expedition. In the light of his later successes, the year 1970 can be regarded as one of the turning points in Messner's life. 1970 Nanga Parbat (8,125) First ascent of the unclimbed Rupal Face and first traverse of the mountain by descending along the unexplored Diamir Face (with his brother Günther). 1972 Manaslu (8,163) First ascent of the unclimbed South-West Face, of which neither a photo existed before. First ascent of Manaslu without supplemental oxygen. 1975 Gasherbrum I (8,080) First ascent without supplemental oxygen (with Peter Habeler). 1978 Mount Everest (8,848), Nanga Parbat (8,125) First ascent of Everest without supplementary oxygen (with Peter Habeler). Nanga Parbat: first solo ascent of 8000er from basecamp. He established a new route on the Diamir Face, which has since then never been repeated. 1979 K2 (8,611) Ascent partially in alpine style with Michael Dacher on the Abruzzi Spur. 1980 Mount Everest (8,848) First to ascend alone and without supplementary oxygen – from basecamp to summit - during the monsoon. He established a new route on the North Face. 1981 Shishapangma (8,027) Ascent with Friedl Mutschlechner. 1982 Kangchenjunga (8,586), Gasherbrum II (8,034), Broad Peak (8,051) New route on Kangchenjunga's North Face, partially in alpine style with Friedl Mutschlechner. Gasherbrum II and Broad Peak: Both ascents with Sher Khan and Nazir Sabir. Messner becomes the first person to climb three 8000er in one season. Also a failed summit attempt on Cho Oyu during winter. 1983 Cho Oyu (8,188) Ascent with Hans Kammerlander and Michael Dacher on a partially new route. 1984 Gasherbrum I (8,080), Gasherbrum II (8,034) First traverse of two 8000er; all achieved at one time without returning to basecamp (with Hans Kammerlander). 1985 Annapurna (8,091), Dhaulagiri (8,167) First ascent of Annapurna's unclaimed North-West Face. Both ascents with Hans Kammerlander. 1986 Makalu (8,485), Lhotse (8,516) Makalu: Ascent with Hans Kammerlander and Friedl Mutschlechner, Lhotse: Ascent with Hans Kammerlander. Messner becomes the first person in climbing history who successfully achieved all 14 8000er. Reinhold Messner took a total of five expeditions to Nanga Parbat. In 1970 and 1978 he reached the summit (in 1978 solo); in 1971, 1973 and 1977, he did not. In 1971 he was primarily looking for his brother's remains. In May and June 1970, Reinhold Messner took part in the Nanga Parbat South Face expedition led by Karl Herrligkoffer, the objective of which was to climb the as yet unclimbed Rupal Face, the highest rock and ice face in the world. Messner's brother, Günther, was also a member of the team. On the morning of 27 June, Messner was of the view that the weather would deteriorate rapidly, and set off alone from the last high-altitude camp. Surprisingly his brother climbed after him and caught up to him before the summit. By late afternoon, both had reached the summit of the mountain and had to pitch an emergency bivouac shelter without tent, sleeping bags and stoves because darkness was closing in. The events that followed have been the subject of years of legal actions and disputes between former expedition members, and have still not been finally resolved. What is known now is that Reinhold and Günther Messner descended the Diamir Face, thereby achieving the first crossing of Nanga Parbat (and second crossing of an eight-thousander after Mount Everest in 1963). Reinhold arrived in the valley six days later with severe frostbite, but survived. His brother, Günther, however died on the Diamir Face—according to Reinhold Messner on the same descent, during which they became further and further separated from each other. As a result, the time, place and exact cause of death is unknown. Messner claimed his brother had been swept away by an avalanche. In the early years immediately after the expedition, there were disputes and lawsuits between Messner and the expedition leader, Karl-Maria Herrligkoffer. After a quarter-century of peace, the dispute flared up again in October 2001, when Messner raised surprising allegations against the other members of the team for failing to come to their aid. 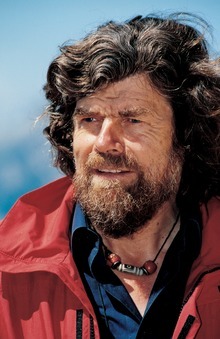 The rest of the team consistently maintained that Reinhold Messner had told them of his idea for crossing the mountain before setting off for the summit. Messner himself asserts, however, that he made a spontaneous decision to descend the Diamir Face together with his brother for reasons of safety. A number of new books—by Max von Kienlin, Hans Saler, Ralf-Peter Märtin, and Reinhold Messner—stoked the dispute (with assumptions and personal attacks) and led to further court proceedings. In June 2005, after an unusual heat wave on the mountain, the body of his brother was recovered on the Diamir Face, which seems to support Messner's account of how Günther died. The drama was turned into a film Nanga Parbat (2010) by Joseph Vilsmaier, based on the memories of Reinhold Messner and without participation from the other former members of the expedition. Released in January 2010 in cinemas, the film was criticized by the other members of the team for telling only one side of the story. Because of severe frostbite, especially on his feet—six toes were amputated—Messner was not able to climb quite as well on rock after the 1970 expedition. He therefore turned his attention to higher mountains, where there was much more ice. After three unsuccessful expeditions, Reinhold Messner reached the summit of Nanga Parbat again via the Diamir Face on 9 August 1978. In 1972, Messner succeeded in climbing Manaslu on what was then the totally unknown south face of the mountain, of which there were not even any pictures. From the last high-altitude camp he climbed with Frank Jäger, who turned back before reaching the summit. Shortly after Messner reached the summit, the weather changed and heavy fog and snow descended. Initially Messner became lost on the way down, but later found his way back to the camp, where Horst Fankhauser and Andi Schlick were waiting for him and Jäger. Jäger did not return, although his cries were heard from the camp. Orientation had become too difficult. Fankhauser and Schlick began to search for him that evening, but lost their way and sought shelter at first in a snow cave. Messner himself was no longer in a position to help the search. The following day, only Horst Fankhauser returned. Andi Schlick had left the snow cave during the night and become lost. So the expedition had to mourn the loss of two climbers. Messner was later criticised for having let Franz Jäger go back down the mountain alone. The ascent of Gasherbrum I saw for the first time a mountaineering expedition succeeding in scaling an eight-thousander using alpine style climbing. Until that point, all fourteen 8000-meter peaks had been summitted using the expedition style, though Hermann Buhl had earlier advocated "West Alpine Style" (similar to "capsule" style, with a smaller group relying on minimal fixed ropes). Together with Peter Habeler, Messner succeeded in making the second ascent of Gasherbrum I on 10 August 1975, becoming the first man ever to climb more than two eight-thousanders. Messner reached the summit again in 1984, this time together with Hans Kammerlander. This was achieved as part of a double ascent where, for the first time, two eight-thousander peaks (Gasherbrum I and II) were climbed without returning to base camp. Again, this was done in alpine style, i.e. without the pre-location of stores. On 8 May 1978, Reinhold Messner stood with Peter Habeler on the summit of Mount Everest; the first men known to climb Everest without the use of supplemental oxygen. Prior to this ascent it was disputed whether this was possible at all. Messner and Habeler were members of an expedition led by Wolfgang Nairz along the southeast ridge to the summit. Also on this expedition was Reinhard Karl, the first German to reach the summit, albeit with the aid of supplemental oxygen. Two years later, on 20 August 1980, Messner again stood atop the highest mountain in the world. This time, too, the ascent was made without supplementary oxygen. For this solo climb, he chose the northeast ridge to the summit, where he crossed above the North Col in the North Face to the Norton Couloir and became the first man to climb through this steep gorge to the summit. Messner decided spontaneously during the ascent to use this route to bypass the exposed northeast ridge. Prior to this solo ascent, he had not set up a camp on the mountain. For 1979, Messner was planning to climb K2 on a new direct route through the South Face, which he called the "Magic Line". Headed by Messner, the small expedition consisted of six climbers: Italians Alessandro Gogna, Friedl Mutschlechner and Renato Casarotto; the Austrian, Robert Schauer; and Germans Michael Dacher, journalist, Jochen Hölzgen, and doctor Ursula Grether, who was injured during the approach and had to be carried to Askole by Messner and Mutschlechner. Because of avalanche danger on the original route and time lost on the approach, they decided on climbing via the Abruzzi Spur. The route was equipped with fixed ropes and high-altitude camps, but no hauling equipment (Hochträger) or bottled oxygen was used. On 12 July, Messner and Dacher reached the summit; then the weather deteriorated and attempts by other members of the party failed. During his stay in Tibet as part of his Everest solo attempt, Messner had the opportunity to explore Shishapangma. A year later, Messner, with Friedel Mutschlechner, Oswald Oelz and Gerd Baur, set base camp on the north side of the only eight-thousander which is entirely within Chinese territory. On 28 May, Messner and Mutschlechner reached the summit in very bad weather; part of the climb involving ski mountaineering. In 1982, Messner wanted to become the first climber ever to scale three eight-thousanders in one year. He was planning on climbing Kangchenjunga first, before tackling Gasherbrum II and the Broad Peak. Messner had chosen a new variation of the route up the North Face. Because there was still a lot of snow at the time of the expedition, Messner and Mutschlechner made very slow progress. In addition, the sheer difficulty of the climb forced the two mountaineers to use fixed ropes. Finally, on 6 May, Messner, Mutschlechner and Ang Dorje stood on the summit. There, Mutschlechner suffered frostbite to his hands, and later to his feet as well. Whilst bivouacking during the descent, the tent tore away from Mutschlechner and Messner, and Messner also fell ill. He was suffering from amoebic liver abscess, making him very weak. In the end he only made it back to base camp with Mutschlechner's help. After his ascent of Kangchenjunga, Mutschlechner flew back to Europe because his frostbite had to be treated and Messner needed rest. Thus the three mountains could not be climbed as planned. Messner was cured of his amoebic abscess in the liver and then travelled to Gasherbrum II, but could not use the new routes as planned. In any case, his climbing partners, Sher Khan and Nazir Sabir, would not have been strong enough. Nevertheless, all three reached the summit on 24 July in a storm. During the ascent, Messner discovered the body of a previously missing Austrian mountaineer, whom he buried two years later at the G I – G II crossing. 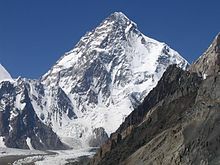 Broad Peak was the third eight-thousander scaled by Messner in 1982. 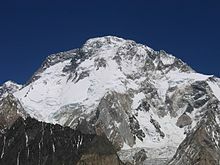 At the time, he was the only person with a permit to climb this mountain, but he came across Jerzy Kukuczka and Wojciech Kurtyka, who had permits to climb K2, but used its geographic proximity to climb Broad Peak illegally. In early descriptions of the ascent, Messner omitted to mention this encounter, but he referred to it several years later. On 2 August, Messner was reunited with Nazir Sabir and Khan again on the summit. The three mountaineers had decamped and made for Broad Peak immediately after their ascent of Gasherbrum II. The climb was carried out with a variation from the normal route at the start. In the winter of 1982/1983, Messner attempted the first winter ascent of Cho Oyu. He reached an altitude of about 7,500 metres, when great masses of snow forced him to turn back. This expedition was his first with Hans Kammerlander. A few months later, on 5 May, he reached the summit via a partially new route together with Kammerlander and Michl Dacher. In 1985, Messner topped out on Annapurna. Using a new route on the northwest face, he reached the summit with Kammerlander on 24 April. Also on the expedition were Reinhard Patscheider, Reinhard Schiestl and Swami Prem Darshano, who did not reach the summit. Even during Messner and Kammerlander's ascent the weather was not good and they had to be assisted by the other three during the descent due to heavy snowfall. Messner had already attempted Dhaulagiri in 1977 and 1984, but failed. In 1985 he finally summited. He climbed with Kammerlander up the normal route along the northeast ridge. After only three days of climbing they stood on the summit in a heavy storm on 15 May. Messner tried climbing Makalu four times. He failed in 1974 and 1981 on the South Face of the south-east ridge. In winter 1985/1986 he attempted the first winter ascent of Makalu via the normal route. Even this venture did not succeed. Not until February 2009 was Makalu successfully climbed in winter by Denis Urubko and Simone Moro. In 1986, Messner returned and succeeded in reaching the summit using the normal route with Kammerlander and Mutschlechner. Although they had turned back twice during this expedition, they made the summit on the third attempt on 26 September. During this expedition, Messner witnessed the death of Marcel Rüedi, for whom the Makalu was his 9th eight-thousander. Rüedi was on the way back from the summit and was seen by Messner and the other climbers on the descent. Although he was making slow progress, he appeared to be safe. The tea for his reception had already been boiled when Rüedi disappeared behind a snow ridge and did not reappear. He was found dead a short time later. Messner climbed his last normal route. Both climbers had to contend with a strong wind in the summit area. To reach the summit that year and before winter broke, they took a direct helicopter flight from the Makalu base camp to the Lhotse base camp. Thus Messner became the first person to climb all eight-thousanders. Since this ascent, Messner has never climbed another eight-thousander. In 1989, Messner led a European expedition to the South Face of the mountain. The aim of the expedition was to forge a path up the as-yet-unclimbed face. Messner himself did not want to climb any more. The expedition was unsuccessful. Reinhold Messner in 1985 in Pamir Mountains. 1996 – Trip through East Tibet and to Kailash. In 1985 Richard Bass first postulated and achieved the mountaineering challenge Seven Summits, climbing the highest peaks of each of the seven continents. Messner suggested another list (the Messner or Carstensz list) replacing Mount Kosciuszko with Indonesia's Puncak Jaya, or Carstensz Pyramid (4,884 m (16,024 ft)). From a mountaineering point of view the Messner list is the more challenging one. Climbing Carstensz Pyramid has the character of an expedition, whereas the ascent of Kosciuszko is an easy hike. In May 1986 Pat Morrow became the first person to complete the Messner list, followed by Messner himself when he summitted Mount Vinson in December 1986 to become the second. Messner is listed nine times in the Guinness Book of Records. All these records belong to "World's Firsts" category, known also as Historical Firsts. "World's First" is the highest form of Guinness World Record, the ownership of this title never expires. As of 2018 it is the world's highest number of "World's Firsts" held by an individual. In 2003 Messner started work on a project for a mountaineering museum. On 11 June 2006, the Messner Mountain Museum (MMM) opened, a museum that unites within one museum the stories of the growth and decline of mountains, culture in the Himalayan region and the history of South Tyrol. MMM Firmian at Sigmundskron Castle near Bozen is the centerpiece of the museum and concentrates on man's relationship with the mountains. Surrounded by peaks from the Schlern and the Texel range, the MMM Firmian provides visitors with a series of pathways, stairways, and towers with displays that focus on the geology of the mountains, the religious significance of mountains in the lives of people, and the history of mountaineering and alpine tourism. The so-called white tower is dedicated to the history of the village and the struggle for the independence of South Tyrol. MMM Juval at Juval Castle in the Burggrafenamt in Vinschgau is dedicated to the "magic of the mountains", with an emphasis on mystical mountains, such as Mount Kailash or Ayers Rock and their religious significance. MMM Juval houses several art collections. MMM Dolomites, known as the Museum in the Clouds, is located at Monte Rite (2181 m) between Pieve di Cadore and Cortina d'Ampezzo. Housed in an old fort, this museum is dedicated to the subject of rocks, particularly in the Dolomites, with exhibits focusing on the history of the formation of the Dolomites. The summit observation platform offers a 360° panorama of the surrounding Dolomites, with views toward Monte Schiara, Monte Agnèr, Monte Civetta, Marmolada, Monte Pelmo, Tofana di Rozes, Sorapis, Antelao, Marmarole. MMM Ortles at Sulden on the Ortler is dedicated to the theme of ice. This underground structure is situated at 1900 metres and focuses on the history of mountaineering on ice and the great glaciers of the world. The museum contains the world's largest collection of paintings of the Ortler, as well as ice-climbing gear from two centuries. MMM Ripa at Brunico Castle in South Tyrol is dedicated to the mountain peoples from Asia, Africa, South America and Europe, with emphasis on their cultures, religions, and tourism activities. MMM Corones, opened in July 2015 on the top of the Kronplatz mountain (Plan de Corones in Italian), is dedicated to traditional climbing. 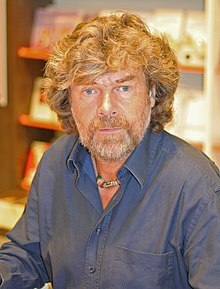 In 1999 Reinhold Messner was elected Member of the European Parliament for the Federation of the Greens (FdV), the Italian green party, receiving more than 20,000 votes in the European election. He fully served his term until 2004, when he retired from politics. Messner was officially a member of South Tyrolean Greens, a regionalist and ecologist political party active only in South Tyrol, who de facto acts as a regional branch of the FdV. During all his life, even after the end of his political career, he has been a strong supporter of green and environmentalist policies and an activist in the fight against global warming. Gasherbrum – Der leuchtende Berg – A 1985 Werner Herzog TV documentary, also known as "The Dark Glow of the Mountains". Portrait of a Snow Lion – BBC/France3 1992 documentary on Messner, Part 4 of the series "The Climbers". Messner – Les Guthman's 2002 feature documentary on Messner. Nanga Parbat – A 2010 film based on Messner's achievements. The Unauthorized Biography of Reinhold Messner – A 1999 album released by Ben Folds Five, named after the name used on a fake ID of one of the band members in his youth, not directly after Messner himself. In The Lost World Jurassic Park Roland Tembo mentions to Nick Van Owen about Messner's experience about climbing Mt Everest but couldn't remember Messner's name. ^ Messner, Reinhold (1991). Antarctica: Both Heaven and Hell. ISBN 9780898863055. ^ Messner, Reinhold (2013). Gobi: Il deserto dentro di me. ISBN 9788897173236. ^ a b Alexander, Caroline (November 2006). "Murdering the Impossible". National Geographic. ^ Rhoads, Christopher (11 December 2003). "The controversy surrounding Reinhold Messner". The Wall Street Journal. Retrieved 7 February 2008. ^ Connolly, Kate (19 January 2010). "Nanga Parbat film restarts row over Messner brothers' fatal climb". The Guardian. London. Retrieved 22 May 2010. ^ "Reinhold Messner - Home". Reinhold-messner.de. Archived from the original on 18 October 2016. Retrieved 20 September 2016. ^ Messner, Reinhold (1979). Aufbruch ins Abenteuer. Der berühmteste Alpinist der Welt erzählt. Bergisch Gladbach, p. 122 – 133. ^ Moro, Simone (2016). Nanga: Fra rispetto e pazienza, come ho corteggiato la montagna che chiamavano assassina. ISBN 9788817090230. ^ "Nanga Parbat Body Ends Messner Controversy". Outdoors Magic. 19 August 2005. Retrieved 14 March 2014. ^ a b Connolly, Kate (19 January 2010). "Nanga Parbat film restarts row over Messner brothers' fatal climb". The Guardian. Retrieved 14 March 2014. ^ a b c d e f g h i j k l m n Messner, Reinhold (2002). Überlebt – Alle 14 Achttausender mit Chronik BLV, Munich. ^ Messner, Reinhold/Gogna, Alessandro: K2 – Berg der Berge. BLV, Munich 1980. ^ a b Messner, Reinhold: Alle meine Gipfel. Herbig, Munich 1983. ^ a b History of 7 Summits project — who was first? ^ "Official Guinness Registry". Guinness World Records. Archived from the original on 2018-05-29. Retrieved 2018-05-29. ^ "MMM Firmian". Messner Mountain Museum. Archived from the original on 16 July 2014. Retrieved 9 February 2014. ^ "MMM Juval". Messner Mountain Museum. Archived from the original on 25 February 2014. Retrieved 9 February 2014. ^ "MMM Dolomites". Messner Mountain Museum. Archived from the original on 25 February 2014. Retrieved 9 February 2014. ^ "MMM Ortles". Messner Mountain Museum. Archived from the original on 25 February 2014. Retrieved 9 February 2014. ^ "MMM Ripa". Messner Mountain Museum. Archived from the original on 25 February 2014. Retrieved 9 February 2014. ^ Federica Lusiardi. "Zaha Hadid's MMM Corones museum gazes at the mountains". Inexhibit. Retrieved November 25, 2015. ^ "Search for a Member; European Parliament". Europarl.europa.eu. Retrieved 2016-09-20. Messner, Reinhold (1998). Free Spirit: A Climber's Life. Seattle, WA, USA: Mountaineers Books. ISBN 978-0-89886-573-8. Messner, Reinhold (1998). The Crystal Horizon: Everest – The First Solo Ascent. Seattle, WA, USA: Mountaineers Books. ISBN 978-0-89886-574-5. Messner, Reinhold (1999). All Fourteen 8,000ers. Seattle, WA, USA: Mountaineers Books. ISBN 978-0-89886-660-5. Messner, Reinhold (2001). The Big Walls: From the North Face of the Eiger to the South Face of Dhaulagiri. Seattle, WA, USA: Mountaineers Books. ISBN 978-0-89886-844-9. Messner, Reinhold (2001). Moving Mountains: Lessons on Life and Leadership. Provo, UT, USA: Executive Excellence Publishing. ISBN 978-1-890009-90-8. Messner, Reinhold; trans. by Tim Carruthers (2002). The Second Death of George Mallory: The Enigma and Spirit of Mount Everest. New York, NY, USA: St. Martin's Griffin. ISBN 978-0-312-27075-9. Messner, Reinhold (2003). The Naked Mountain. Seattle, WA, USA: Mountaineers Books. ISBN 978-0-89886-959-0. Messner, Reinhold (2014). My Life at the Limit. Seattle, WA, USA: Mountaineers Books. ISBN 978-1-59485-852-9. Wetzler, Brad (October 2002). "Reinhold Don't Care What You Think". Outside Magazine. Archived from the original on 22 September 2010. Krakauer, Jon. Into Thin Air. United States of America: Random House, 1800. Messner, Reinhold (October 1981). "I Climbed Everest Alone... At My Limit". National Geographic. Vol. 160 no. 4. pp. 552–566. ISSN 0027-9358. OCLC 643483454. 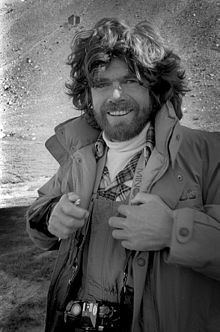 Wikimedia Commons has media related to Reinhold Messner. Gaia Symphony Documentary series (Japanese production).